It’s time for another monthly financial check-in! Let’s start with a look at my net worth. Currently, I have $88,649.83 in assets and $1,384.14 in debts — all credit card debt, but I pay my statement balances in full every month — for a total net worth of $87,265.69. I owe at least some of that net worth to the stock market’s recent rebound, and the rest comes from the typical combination of a) earning more money, b) spending less than I earn, and c) prioritizing investments. Which means it’s time to look at exactly how much I spent in January 2019! 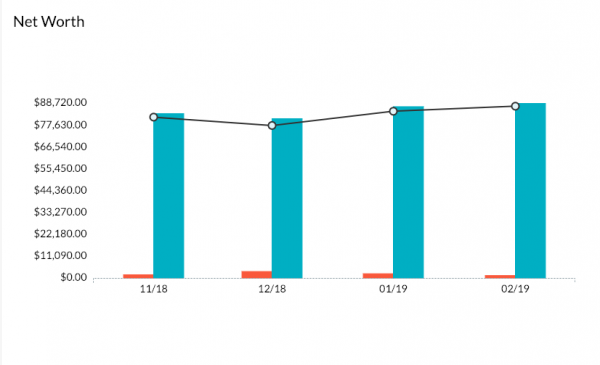 You might remember that I put myself on a fairly strict YNAB budget this year, and have allocated myself $5,000 per month for all my necessary transactions, including business expenses and taxes. I anticipate earning more than $5,000 each month, which means that any extra earnings will go towards increasing my financial runway — that is, increasing the amount of time that I can live on the money I’ve already earned. These expenses total $3,824.77, but the remaining $1,175.23 dollars in my January budget all have jobs and will carry forward in my YNAB budget so that they can be spent spent later in the year. This is how I can save up for larger purchases (you might notice I didn’t spend anything on clothing this month, but am likely to do a big clothing shop this spring) and still hit my “no more than $5K/month” goal. In other words: I can spend February’s $5K plus any of the $5K that didn’t get spent in January, and so on. Also, I didn’t spend any money on taxes this month — I paid my fourth quarter estimated taxes in December, even though they weren’t due until January 15 — but that also comes out of the remaining $1,175.23.